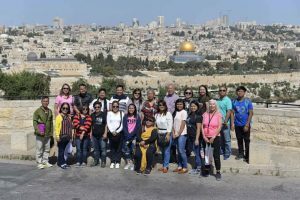 Larry’s Classic Tours, a member of the Israel Chamber of Commerce of the Philippines (ICCP), is a tour and travel operator. Mary Anne D. Tolentino established the company in honor of her father, Larry Tolentino, who loved organizing pilgrimages and tours, customized for his guests’ enjoyment. He brought them to beautiful and spiritually significant places. Mary Ann watched and learned his techniques for 20 years while working as a banking executive. Larry’s Classic Tour Group at a recent trip to the Holy Land. The signature packages of Larry’s Classic Tours are retreats and pilgrimages to the Holy Land, as well as spiritually uplifting destinations in Europe. For instance, the company’s Gospel Pilgrimage takes tourists to Israel, where the group visits various places mentioned in the Bible. The Marian Pilgrimage travels from Lisbon, Portugal to Rome, Italy visiting various cultural and religious highlights. Larry’s Classic Tours brings visitors to a range of destinations all over Europe, the Middle East, and the Americas. In Europe, tours usually have a theme or common objective. These special tours include Christmas packages in Scandinavia, England or France and pilgrimage packages to Europe’s basilicas and popular churches. The company also organizes study tours to Israel’s agricultural centers. The tours are designed primarily for agriculturists from the Philippines who are looking for practices and technologies they can adopt at home. Israel’s research community is open to accepting guests and sharing their successes. If you want more information about the company’s travel packages, visit their website at http://www.larrysclassictours.com or call them at +632 869 6050. You may also visit their office at No. 24 J Cabarrus St. BF Homes Commercial District, BF Homes Paranaque, 1720 Metro Manila Philippines.